The gallery is located on the second floor of the Jean and Charles Schulz Information Center (Library). A public reception will be held May 10 from 4-5:30 p.m. The exhibition is being organized by the students in a Museum Theory and Practice class, under the supervision of Art professor Michael Schwager. Art has always reflected the times in which it is created, and art by current college and university students is no exception. 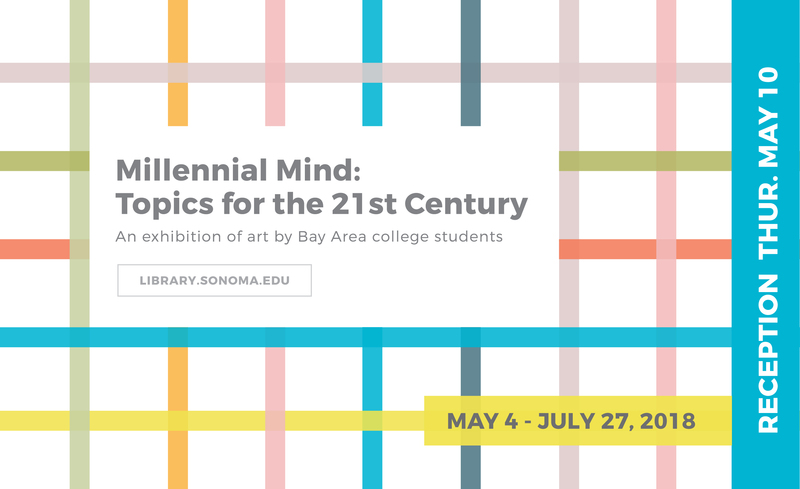 The concept for Millennial Mind the grew out of a discussion among SSU’s Museum Theory and Practice students in response to an invitation from the SSU Library to present an exhibition of student art. The students were interested in how issues in the news today — gun violence, immigration, gender and ethnicity, technology —were affecting their peers in studio courses who were creating art against the backdrop of these complex and often troubling events. As the discussion grew, so did the concept of the exhibition, which ultimately resulted in invitations to art students in colleges and universities throughout the Bay Area to submit work to be considered for the show. To date, in addition to SSU, students from Napa Valley College, San Francisco State University, Santa Rosa Junior College, UC Berkeley and UC Davis have submitted work in a variety of media for the exhibition. “Millennial Mind promises to be an exciting and thought-provoking exhibition that will offer viewers an insight into what the next generation of artists is thinking about and how the events of today are shaping their work,” said Schwager. The Library Gallery hours can be found at library.sonoma.edu. Campus parking is $5 at all times. Campus map here.